Is the one on the right a starfish too? 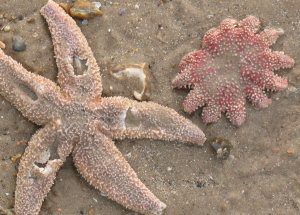 Took this photo of what I think are two different kinds of dead starfish on a freezing Old Hunstanton beach. I'm not at the seaside often, so can anyone confirm that the one on the right definitely is a starfish, and what type it is, as I can't find it in my seaside identification book, or online? It was swept away immediately, but I think it was about 4 inches in diameter.